A Palestinian youth was injured Monday when the Israeli occupation forces (IOF) attacked a peaceful march near Bardala village in the northern Jordan Valley. Medical sources reported that the youth was directly hit with a teargas canister by the IOF soldiers, adding that he was later transferred to a local medical center for treatment. Organized by the National Committee Against the Wall and Settlement, the march was attended by dozens of Bardala residents who slammed Israel for destroying their water networks and stealing Palestinian water resources. 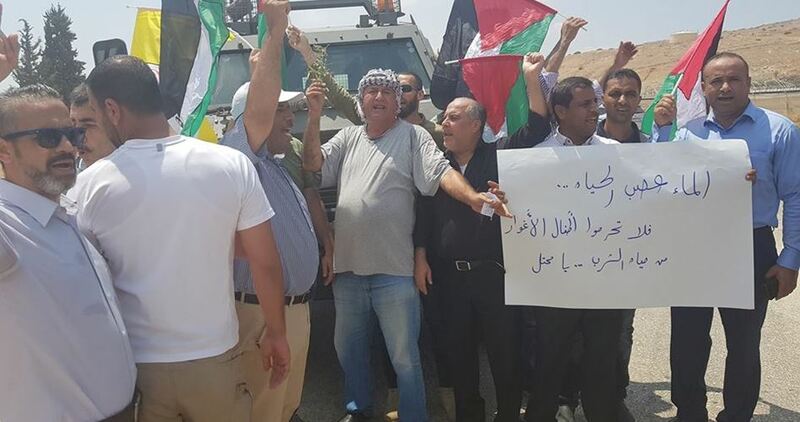 The marchers gathered on Road 90 in the Jordan Valley and raised banners condemning the Israeli violations. Activist Mu’taz Bisharat said that Israeli settlers on a regular basis attack Bardala’s farmlands and destroy the water pipes used for the crops, adversely affecting the village’s agriculture.